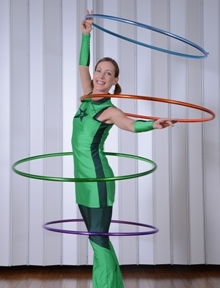 Sophie has a great solo show to present in schools, the all new ‘One woman circus’ show. The show last about 45-50 minutes and presents several impressive professional circus acts using circus prop manipulation, dance, acrobatic and audience partication all set to music in a professional costume. This show is great for schools, day cares, birthday parties and large events and can also include workshop for school age kids. The show leaves kids inspired and empowered. 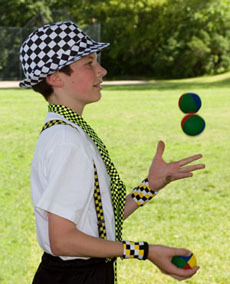 During the circus workshops, participants explore various circus arts and learn some fundamental techniques of prop manipulation such as juggling, hula hoop, poi, spinning plates, flower sticks and diabolo as well as aerial arts such as trapeze and silks. 1 to 5 hours in a day, and up to 5 days. A 5 full day workshop can also culminate in a performance. Workshop can be offered in schools in the gymnasium focused on prop manipulation or we can invite you to the Ottawa Circus School for event more fun circus workshop that includes both prop manipulation and aerial arts. Circus is an art form that has inspired children and adults for thousands of years. Circus is a non-competitive sport in which children have the opportunity to develop their abilities at their own pace and encourage self discipline. 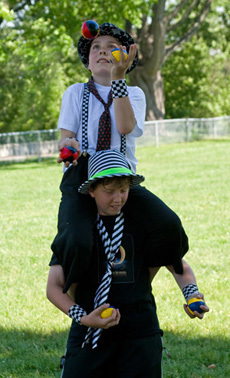 Circus arts help students develop on all levels while practicing an enjoyable activity. While learning to use circus props students increase their fine and gross motor skills (physical level) and their problem solving skills (intellectual level). 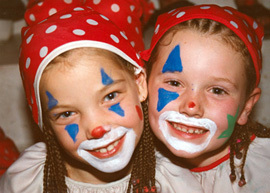 While learning mime and clown arts, students increase their ability to express themselves (emotional level). Each of the arts that they will learn will eventually be practiced with other students; this will increase their ability to interact with others (social level). Learning some skills they may have thought they never would have been able to learn results in a higher level of self-confidence and productivity in other aspects of their education and their lives outside of school. "Through their play, children express themselves, experiment, construct their learnings, structure their thoughts and develop their worldview. They learn to be themselves, to interact with others and to solve problems. They develop their imagination and creativity." The circus workshops also motivate the children to adopt an active lifestyle by teaching them physical games that they can continue to practice at home either on their own or with their peers. Circus is a non-competitive activity in which children have the opportunity to develop their abilities at their own pace and it encourages self discipline. The program aims to enrich the life of the child by allowing him to undergo a privileged experience, expose him to a new art form, provide tools that will encourage him to be more physically active, instil the desire to challenge himself, and help him develop psychomotor skills. Sophie also specialized in educational school programs during the 3 years that she worked at the Canadian Museum of Civilizations (2003-2005). Sophie has also taught dance and creative movement to children at the Studio de dance Danielle in Aylmer (1991-1993). Through these experiences, Sophie has developed strong abilities in managing a group of students, maintaining discipline and making sure each child benefits from the program. A guest artist program can be offered as a half day workshop (2 hours), a full day workshop (5 hours) during the school day or over several days. The goal of the workshop is to provide a unique opportunity for kids to discover a new artform with a professional in the field. All programs are also available in French. And the workshops are fun too! Contact us for more information or to reserve a workshop. "As long as we can play we will be young at heart." Teachers and kids love their Mini Cirque experiences! Visit the Mini Cirque in Schools reviews section of the reviews page to see real, first hand reviews of Mini Cirque by teachers and kids. To see where Mini Cirque workshops have been (or will be) held, please visit the Where we've been page. Reserve your Mini Cirque performance and/or workshop for your school today!